The planks are 5/8" thick which is great for any type of food but necessary for thicker cuts of seafood, poultry and meats. You can get 2-3 uses on your barbeque and multiple uses in your oven when directions for barbequing or oven grilling are followed correctly. 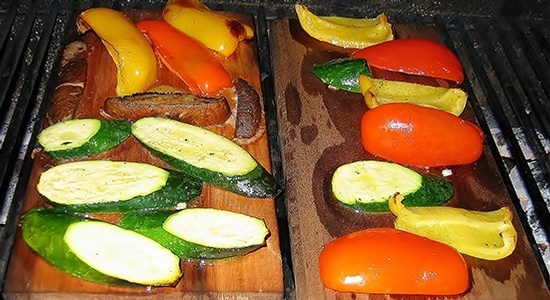 Soak the planks for 2-6 hours (or ideally overnight) before cooking. You may soak your planks in water or any liquid of your choice. (2-3 ratio of Chardonnay-water is great with halibut!) Completely submerge the planks in the liquid. You can use a clean brick to weigh them down; we have used a 4 L jug of water. Preheat your BBQ for 10 minutes on medium heat. 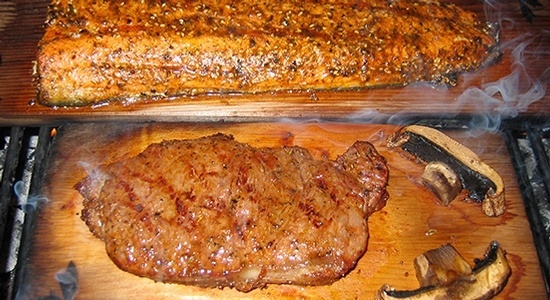 Place marinated items on the grilling plank. For best results, have one side of your BBQ on high heat and the other side which is the side you will be grilling on, on med/low heat. Usual cooking time for seafood will be 5-8 minutes per inch of thickness. Our products are available to clients across Kelowna, Vernon, Penticton, Vancouver, Victoria, Portland, British Columbia, Calgary, Edmonton, Alberta, Canada and Seattle in the United States of America.